What Form of Government Should Christians Choose? The soul is the most valuable of all God’s creations (Matt. 16:26). Our foundational political documents and the life that flows from them ought to reflect this in some way. But they do not. There is less than one week remaining before the various elections are held across the Union, and members of the various factions and parties cannot wait to do battle at the ballot box, to subdue their enemies with the force of their vote. Their anticipation is at a fever pitch. And when elections are far off, still the different factions distrust and denounce and work for the destruction of the others. This should tell us something about our spiritual state (that its current condition is very dreadful and wretched), and about the effect of our political system on our souls (it inclines us toward sin - pride, atheism, anger, and so on). In democracy and a republic, all citizens are called to politics, to participation in power. Democracy is the power of the people. The ideal of the republic is born from the aspiration that the people govern itself – through its representatives, as now, or in antiquity, through direct democracy. The metaphysical underpinnings of this are what the well-known twentieth-century political philosopher Hannah Arendt called the drive of people from the masses, the lower classes, to also “come into their own,” signifying their existence and appearing to the world as a full participant. Here people already begin to be directed primarily not by the aspiration “to live a pacific and quiet life in every piety and purity,” but rather the desire to be noticed in the world, to enter stormy political life full of passions, anxieties, and temptation. Incidentally, the prominent nineteenth-century Swiss historian of culture and one of the founders of cultural research Jacob Burckhardt termed the polis the “chattiest” of all sovereign forms. What a sharp contrast this is to the aspiration to live a calm and quiet life! And most centrally, as soon as the people establish or constitute a republic and comprehend that they now claim to govern themselves and their fate, religion then inevitably begins to play ever less a role in social and political life. This is logical – after all, in a republic the one source of authority is the will of the people, which as the final source already needs no religious sanction. The people themselves begin to occupy the highest place: vox populi, vox Dei. The Christian monarch, meanwhile, is the anointed of God, and “a man submits to the authority of the monarch not only from fear, but also from a conscience enjoined by God Himself.” Monarchy needs religion, and it naturally flows from the premises of a religious worldview. The ongoing displacement of religion in Europe for over 200 years into the “private sphere,” where everyone can supposedly decide for himself which religion to hold, is not accidental. The state promises to uphold the rights of religion within the confines of personal space, but therein is a palpable deception. Historically, the republican form of sovereignty, secularization and the loss of influence by religion and the Church are tightly connected and mutually dependent processes that developed to their full potency in the modern age. Even as impeccable a Yankee as John Quincy Adams said that the Union ought to last only so long as a spirit of friendship existed among the peoples of the States. And even in his day relations between the sections were growing embittered. Things are no better today. There is no reason why the Union ought to continue on in its present form if we truly desire to live quiet lives pleasing to God (I Tim. 2:2). What has New York to do with Mississippi? Oregon with Arkansas? Connecticut with Oklahoma? Why should the representatives of each contend with one another year in and year out, trying to force irreconcilable worldviews on peoples not their own? It is time we rolled back any overarching authorities (State and federal) so that like-minded groups of people may live in peace together (whether an independent Tennessee or an independent Northern California or New York City or Upper Peninsula of Michigan). The life of a country ought as much as possible to resemble that of the Church, which is its very soul (ideally). And what is to characterize the life of the Church, if not unity through love? Let us hear a word or two on this from Father George Florovsky. The Church is completeness itself; it is the continuation and the fulfilment of the theanthropic union. The Church is transfigured and regenerated mankind. The meaning of this regeneration and transfiguration is that in the Church mankind becomes one unity, "in one body" (Eph. 2:16). The life of the Church is unity and union. The body is "knit together" and "increaseth" (Col 2:19) in unity of Spirit, in unity of love. The realm of the Church is unity. And of course this unity is no outward one, but is inner, intimate, organic. It is the unity of the living body, the unity of the organism. The Church is a unity not only in the sense that it is one and unique; it is a unity, first of all, because its very being consists in reuniting separated and divided mankind. It is this unity which is the "sobornost" or catholicity of the Church. In the Church humanity passes over into another plane, begins a new manner of existence. A new life becomes possible, a true, whole and complete life, a catholic life, "in the unity of the Spirit, in the bond of peace (Eph. 4:3). A new existence begins, a new principle of life, "Even as Thou, Father, art in Me, and I in Thee, that they also may be in Us ... that they may be one even as We are one" (John 17:21-23). This is the mystery of the final reunion in the image of the Unity of the Holy Trinity. It is realized in the life and construction of the Church, it is the mystery of sobornost, the mystery of catholicity. The gauge of catholic union is that "The multitude of them that believed be of one heart and of one soul" (Act 4:32). Where this is not the case, the life of the Church is limited and restricted. The ontological blending of persons is, and must be, accomplished in oneness with the Body of Christ; they cease to be exclusive and impenetrable. The cold separation into "mine" and "thine" disappears. The growth of the Church is in the perfecting of its inner wholeness, its inner catholicity, in the "perfection of wholeness"; "That they may be made perfect in one" (John 17:23). The catholicity of the Church has two sides. Objectively, the catholicity of the Church denotes a unity of the Spirit. "In one Spirit were we all baptized into one body" (1 Cor. 12:13). And the Holy Spirit which is a Spirit of love and peace, not only unites isolated individuals, but also becomes in every separate soul the source of inner peace and wholeness. Subjectively, the catholicity of the Church means that the Church is a certain unity of life, a brotherhood or communion, a union of love, "a life in common." The image of the Body is the commandment of love. "St. Paul demands such love of us, a love which should bind us one to the other, so that we no more should be separated one from the other ... St. Paul demands that our union should be as perfect as is that of the members of one body" (St. John Chrysostom, In Eph. Hom. 11.1, Migne, P.G. lxii, c. 79). The novelty of the Christian commandment of love consists in the fact that we are to love our neighbour as ourselves. This is more than putting him on the same level with ourselves, of identifying him with ourselves; it means seeing our own self in another, in the beloved one, not in our own self .... Therein lies the limit of love; the beloved is our "alter ego," an "ego" which is dearer to us than ourself. In love we are merged into one. "The quality of love is such that the loving and the beloved are no more two but one man" (In 1 Cor. Hom. 33, 3, Migne, P.G. lxi. c. 280). Even more: true Christian love sees in every one of our brethren "Christ Himself." Such love demands self-surrender, self-mastery. Such love is possible only in a catholic expansion and transfiguration of the soul. The commandment to be catholic is given to every Christian. The measure of his spiritual manhood is the measure of his catholicity. The Church is catholic in every one of its members, because a catholic whole cannot be built up or composed otherwise than through the catholicity of its members. No multitude, every member of which is isolated and impenetrable, can become a brotherhood. Union can become possible only through the mutual brotherly love of all the separate brethren. This thought is expressed very vividly in the well known vision of the Church as of a tower that is being built. (Compare the Shepherd of Hermas). This tower is being built out of separate stones-the faithful. These faithful are "living stones" (1 Peter 2:5). In the process of building they fit one into the other, because they are smooth and are well adapted to one another; they join so closely to one another, that their edges are no longer visible, and the tower appears to be built of one stone. This is a symbol of unity and wholeness. But notice, only smooth square stones could be used for this building. There were other stones, bright stones, but round ones, and they were of no use for the building; they did not fit one into the other, were not suitable for the building and they had to be placed near the walls. (Hermas, Vis. 3:2:6,8). In ancient symbolism "roundness" was a sign of isolation, of self-sufficiency and self-satisfaction — teres atque rotundus. And it is just this spirit of self-satisfaction which hinders our entering the Church. The stone must first be made smooth, so that it can fit into the Church wall. We must "reject ourselves" to be able to enter the catholicity of the Church. We must master our self-love in a catholic spirit before we can enter the Church. And in the fulness of the communion of the Church the catholic transfiguration of personality is accomplished. But the rejection and denial of our own self does not signify that personality must be extinguished, that it must be dissolved within the multitude. Catholicity is not corporality or collectivism. On the contrary, self-denial widens the scope of our own personality; in self-denial we possess the multitude within our own self; we enclose the many within our own ego. Therein lies the similarity with the Divine Oneness of the Holy Trinity. In its catholicity the Church becomes the created similitude of Divine perfection. The Fathers of the Church have spoken of this with great depth. In the East St. Cyril of Alexandria; in the West St. Hilary. (For Patristic quotations very well arranged and explained, see E. Mersch, S.J., Le Corps Mystique du Christ, Etudes de Théologie Historique, t. 1-2, Louvain, 1933). In contemporary Russian theology the Metropolitan Antony has said very adequately, "The existence of the Church can be compared to nothing else upon earth, for on earth there is no unity, but only separation. Only in heaven is there anything like it. The Church is a perfect, a new, a peculiar, a unique existence upon earth, a unicum, which cannot be closely defined by any conception taken from the life of the world. The Church is the likeness of the existence of the Holy Trinity, a likeness in which many become one. Why is it that this existence, just as the existence of the Holy Trinity, is new for the old man and unfathomable for him? Because personality in its carnal consciousness is a self-imprisoned existence, radically contrasted with every other personality (Archbishop Anthony Khapovitsky, The Moral Idea of the Dogma of the Church, Works, vol. 2, pp. 17-18. St. Petersburg, 1911). "Thus the Christian must in the measure of his spiritual development set himself free, making a direct contrast between the ‘ego’ and the ‘non-ego’ he must radically modify the fundamental qualities of human self-consciousness" (Ibid., The Moral Idea of the Dogma of the Holy Trinity, p. 65). It is just in this change that the catholic regeneration of the mind consists. There are two types of self-consciousness and self-assertion: separate individualism and catholicity. Catholicity is no denial of personality and catholic consciousness is neither generic nor racial. It is not a common consciousness, neither is it the joint consciousness of the many or the Bewusstsein ueberhaupt of German philosophers. Catholicity is achieved not by eliminating the living personality, nor by passing over into the plane of an abstract Logos. Catholicity is a concrete oneness in thought and feeling. Catholicity is the style or the order or the setting of personal consciousness, which rises to the "level of catholicity." It is the "telos" of personal consciousness, which is realized in creative development, not in the annihilation of personality. In catholic transfiguration personality receives strength and power to express the life and consciousness of the whole. And this not as an impersonal medium, but in creative and heroic action. We must not say: "Every one in the Church attains the level of catholicity," but "every one can, and must, and is called to attain it." Not always and not by every one is it attained. In the Church we call those who have attained it Doctors and Fathers, because from them we hear not only their personal profession, but also the testimony of the Church; they speak to us from its catholic completeness, from the completeness of a life full of grace. Considering all this, what should be the marks of politics in a Christian country? Equality together with distinction and hierarchy. Not ‘either-or’, but ‘both-and’. Just as the All-Holy Trinity is both One Person and Three Persons. It is a mystery written into the very nature of man, who is made in the image and likeness of God, which we reject at our peril. And we are not without historical manifestations of these marks. In Russia there were both the autonomous local villages and the autocratic Tsars. In England before the Norman Conquest and in Serbia before the Turkish invasion things were likewise. And so on in other Orthodox Christian countries, east and west, before the fall away into the errors of the Roman Catholics (who overemphasized the oneness of the divine essence and thus gave us the suffocating conformity of socialism) and Protestants (who overemphasized the separateness of the Three Persons and thus gave us the individualistic chaos of democracy). The Old South, through the kindness of the Lord, was able to maintain something like an Orthodox society, with both democratic and aristocratic institutions. But none were as fully developed as they were in other Christian countries, and both suffered nearly fatal wounds in the War with the North, to whose political culture they remain in thrall to this day. The work of recovery and rebuilding thus continues on for the Southern people. So then, for Christian kings; strong, united, extended families; and other needful institutions, and for independent Southern States, let us pray: Lord, have mercy! May the Lord bless all of you on this day of the South’s beloved patron saint, St Ælfred the Great, King of England (+899). 849-899. 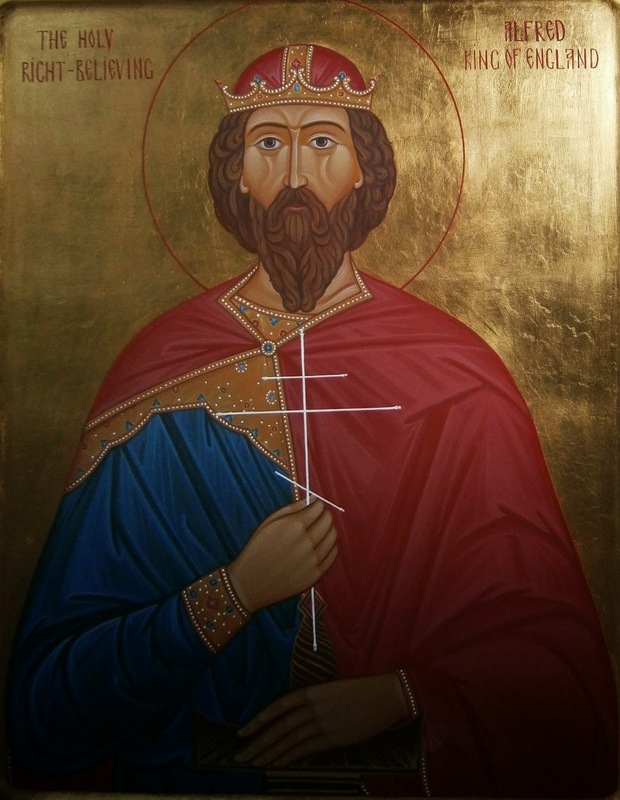 King of Wessex and all Orthodox England who defeated the Danish invaders and ensured the growth of the Church in England. A patron of sacred learning, Alfred the Great himself translated into English such works as the Dialogues of St Gregory the Great. His memory is held by many in great veneration as a patriot and model of Orthodox kingship. In sacred converse gifts with Alfred shares. Ecclesiastical Sonnets, No XXVI, 'Alfred'. Alfred - England's Shepherd and England's Darling. Alfred found learning dead, and he restored it. Education neglected, and he revived it. The laws powerless, and he gave them force. The Church debased, and he raised it. The land ravaged by a fearful enemy, from which he delivered it. Alfred's name shall live as long as mankind respects the past. O Holy St Ælfred, pray to God for us, thy sinful and wicked children at the South, that our souls may be saved! Prof M. E. Bradford’s essay ‘Sentiment or Survival: The Case against Amnesty’ has aged remarkably well (and has proved prophetic in some instances). Though written in 1984 during the debate over the Simpson-Mazzoli immigration bill (which we now know was an utter disaster), the principles Prof Bradford lays out are just as valuable for us today as we grapple with the purposefully irresponsible immigration policy of the federal government regarding, especially, Mexico, Central America, and Ebola-stricken West African nations. It is regrettable that he was so high in his praises of what was then and is now a destructive power in the world (the forced American Union), and so quiet on the subject of the South, in this particular work. But as a faithful Southerner who fought manfully for her on many other occasions, we feel certain that he had her in mind when he mentions things like ‘civil communities which maintain their own institutions and identities, generated by their own respective histories’. May your memory be eternal in the Kingdom of Christ our God, dear brother. The great problem with the people both inside and outside of government whose efforts make fair to ruin the proposed immigration law revisions is that they deny the validity of distinctions separating as categories guest, citizen, and interloper. Any principle that might result in the exclusion or expulsion of any persons not citizens who desire to reside in our midst they find repugnant. If not quite insisting that the “golden doors” be opened to all comers, they nonetheless invoke the doctrine of universal “human rights” as an authority which, in given instances of distress, supersedes all naturalization laws—especially those of prosperous countries where a majority of the population is white—and thus demand a more and more inclusive “amnesty” provision as a part of Simpson-Mazzoli, a conversion of seven or eight million illegal inhabitants of the United States into a special class: criminals rewarded for having committed a crime in violation of our integrity as a sovereign political entity. And the prospect is that this amnesty, covering covert and unauthorized immigrants arriving in this country before January 31, 1982, will be only the first in a series of similar acts, each legitimizing the status as legal permanent or legal temporary residents of the United States of another group of illegal aliens, making them candidates for membership in our body politic, and thus defrauding those who seek to become fellow citizens among us according to our laws. The amnesty provision is of course the worst feature of Simpson-Mazzoli, and was included there in part to attract the supporting votes of legislators who can imagine importing a docile majority to foster their ambitions, presently frustrated by the good sense of the American people. As to the character and judgment of politicians who would create a proletariat where at present not much of one exists I can add little to the verdict of history upon all their kind. Eventually they are all devoured by monsters they have made. And deserve their fate. For where there is no connection but in appetite there can be no limit upon it. But much of the lobbying and contemporary emotion in favor of this amnesty has its source in something more worthy than a plan to assemble and then vote a class of perpetual dependents. I speak now of our honorable disposition to be a hospitable people, ready to receive guests and to give shelter to those who endure exile from their patria for the sake of principle. Even in the most ancient literature of the West, hospitality to travelers and visitors is recognized as the virtue which distinguishes civilized men, those who fear the gods and keep their laws. For the stranger might always be something more than he appeared to be—like Mentor in Homer’s Odyssey or the angels in Genesis 18 who announce to Abraham and Sarah that they will have a son. Peleus had given shelter to Phoenix, who became the tutor of his son Achilles in the Illiad. Ecgtheow, father of Beowulf, had been protected by Hrothgar, the Danish king later assisted by his son. And Virgil’s Dido welcomed Aeneas when the storm drove him to Carthage. According to the teaching, to offer the wanderer safe harbor is to deserve the same, should exile ever be our misfortune. But the old writings also tell us that the law of hospitality is a coin with two faces. The visitors in the Odyssey have abused the house of Odysseus. They have insulted his family, attempted to kill his son, corrupted his servants, and consumed his substance. His old father, Laertes, has been driven into the fields. The Greek gods put a special curse on such violations of privilege. The offenders must die, if respect for the comity of men and nations is to survive. Even as all of Troy must be destroyed because of its after-the-fact complicity in the crime of Paris, a prince of that great city and its representative, against his Spartan host, King Menelaus. Hospitality is an expression of the self-esteem, the spirit of noblesse oblige, to be found among a proud people. It is not a measure of self-interest but of sentiment—reflecting a powerful sense of security and grace. But self-respect has nothing to do with a suicidal passion to “open the gates and let them all come in.” For the first law of every society, even the condition of its gestures of generosity, is that it put the needs of its own members ahead of the needs of outsiders. Such an order of priorities is part of what we mean by the “social contract”: the commitment to certain persons by the terms of which we are precluded from establishing an equivalent bond with others. Said another way, any act of choosing is an act of exclusion as well as of inclusion. We have no social connection with any man if we have the same obligations to all. Any goal contrary to the common good of the corporate “we” which endangers the future of the whole, and sets one of its components or part of its value system so far ahead of the rest as to threaten all, is, in essence, sentimental: indicative of an emotion out of proportion to the context in which it appears. Or worse than sentimental, following from that error which the ancient theologians called cupidity: putting a greater ahead of a lesser good, with all done in the name of love. Thus when our most refined moralists insist that, in questions involving immigration, borders be ignored and distinctions of citizenship set aside, they are repeating the old error of Jean Jacques Rousseau: assuming the superiority of a uniform, dead-level “state of nature” to civil communities which maintain their own institutions and identities, generated by their own respective histories. The philosophers of natural rights prefer to conceive of a polity defined by commitment to propositional statements concering humanus genum, the species at large—ignoring the evidence that most high civilizations have emerged out of a combination of the ties of blood and friendship, of common religious faith and cooperation in business, politics, war, and art, not from generalizations that discourage such cohesion. That the greater human family can be thought of as fulfilling its composite nature only as it subdivides into “little platoons” and tribes and nations—in its repudiation of the presocial isolation of individuals who are “citizens of the world”—the Fathers of the Republic understood clearly, as may be easily determined from an examination of their approach to questions of admission and naturalization of such aliens as desired to settle among them (pgs. 111-14). In or before 1965, few of our public men dared to argue that the distress of immigrants would, by reason of our national identity, our political inheritance, oblige us to receive them, regardless of the preferences of an overwhelming majority of American citizens. Nor prior to that time would one of our erstwhile statesmen have declared that our borders cannot be closed, that illegal aliens cannot be expelled from our midst, or that the rights of American citizens, their values and needs, cannot be preserved against claims from the outside created by the economy, the political atmosphere, and the exploding population of our sister republics immediately to the south. Since the crossing of that watershed, what a failure of nerve we have seen. . . .
That any of our countrymen would think themselves abused because illegal immigrants with a background like their own were not politically protected from the natural consequences of their crimes and allowed to compound them by bringing in more illegal immigrants, their relatives, to join them in their immunities here, would not have occurred as a reasonable cause for concern for any previous generation of American leaders. But that was before we began to make such ado about human rights, and in the process reached a point where we could not sustain any policy—however legal, just, or well-advised it might be—if there was an objection to it that could be made as a special consideration to one of our minority populations. Now we have come so far as to be uncomfortable in defending a way of life which derived its essential properties from the careful and heroic labor of earlier Americans of European ancestry—even if those ancestors were our forefathers. We cannot bring ourselves to repatriate millions of alien criminals or to punish employers who hire them or to require others to carry identification proving that they are rightfully a part of our society—positive provisions of Simpson-Mazzoli. We want an easy solution to the immigration problems that we face, one which makes everyone happy, concerning which no one will complain of racial and/or cultural bias. Thus, in the end, we may have no immigration policy at all: or any perception of the difference between guest, interloper, and citizen; or, finally, any country of our own. If unchecked, more and more illegal immigrants will come from Latin America, Asia, and (eventually) other parts of the world—come by the millions, swamp our system of social services, aggravate our employment problems, subvert our political stability, and thereby stir among us the fires of racial hatred which are heating now in Britain and Germany, France and Sweden, and are a danger in most of the world’s developed nations, except Japan. In other words, we will have precisely the sort of situation which the advocates of amnesty insist that they so much deplore out of a conviction that “there are no longer strangers and sojourners,” but only citizens of the global community. If we thus persist, our children in generations to come will marvel at this circuitous sentimentality—and then pay the price of the cowardice which lies at its source. But if, to the contrary, we would prefer to mean by the word “homeland” something more than a memory, a discursive concept, and a segment of geography (thanks to immigration, all that the Romans understood by patria long before their city fell), then the first order of our business will be to drain the rhetoric of natural rights out of our discussion of what immigration policy we should adopt and enforce. For that rhetoric is appropriate only to an argument from definition, and to a world where God hath not made nations of men, nor appointed “the bounds of their habitation.” Instead our focus should be on the ideas of public virtue and citizenship, of what prospective citizens might bring to their country, and what harm they might do it. For with civil rights go duties, and an obligation to defend the corporate good. That we put first, as prior to other questions, the survival of the homeland should not be a question open to discussion among its sons and daughters—that is, unless the conditions of its survival are shameful. An alien has in the strict sense of the term no civil rights, nor any obligation to protect the cives to which he does not belong. But the citizen has behind him the honor of his countrymen (and some of their resources) when threatened by indignities while beyond the nation’s borders. The Fathers read this lesson in civics in the history of the Punic Wars and in events of British history like the Glorious Revolution. They translated it into the American myth of the citizen-soldier. All of them, that is, except for that noisy radical, Thomas Paine, who went from his role in our Revolution into a very different atmosphere in the France of Danton and Robespierre. As a citizen of the world and a Girondian, in 1792 he allowed himself to be elected to the National Convention. Seventeen months later the Jacobins thought him not radical enough, confined him at Luxembourg and sharpened the guillotine. At that point Thomas Paine rediscovered the value of American citizenship and—in violation of his earlier universalism, to the amusement of our ambassador in Paris, Gouverneur Morris—claimed its protection. In this one instance (if in no other) we should follow Paine’s example—appreciate the value of an incorporated, civil condition, and shape our laws to enhance it, including our laws concerning immigration, naturalization, and illegal entry. And the scale of appropriations necessary if the Immigration and Naturalization Service is expected to enforce them. Finally, in attempting to revive among our brethren some notion of the great value once attached to American citizenship, we should recall that foreign-born aspirants to that privileged estate have never been confused on that subject. Their appeals for a place in our company have always been addressed to the generosity of a sovereign American people, a nation that has offered its citizenship as a free gift to more immigrants than have been received by any other modern state. And it was to the status of citizen that they always aspired, not to a local application of the doctrine of the rights of man. We must not, in a period of low employment and social tension, make the mistake of many advanced societies and bring in (or accept once here illegally) a large population of aliens without a clear plan of how we may absorb and utilize them, without a conviction that they will learn English, accept our culture, our institutions, and follow our ways. Most certainly we must not make this mistake at the suggestion of those loud voices (South and North American) for whom hatred of the United States is axiomatic, the desire for its destruction a daily dream, and the flood of undocumented Mexican workers pouring into our Southwest a kind of reconquista. To specify our firmness on this question we should attach a penalty more severe than mere repatriation to repeated illegal crossings of our border, or offer an award for the identification of interlopers. For belief that the secular religion of natural rights requires the United States to accept eight million of them—for a starter—is tantamount to the mistake in logic that maintains the authority of the same religion to risk a war in order to free the slaves in Siberia. Only if natural rights have priority over the circumstantial objection that, damaged or destroyed, we can protect and liberate no one will we find our first duty so far away from home. On the other hand, if we take seriously the role of citizen then we will compel our elected representatives to recall their prior obligation to the compact between the living, dead, and yet unborn: our prescription from those wise spirits who established among us a general approach to the question of immigration which has allowed us to live together in peace and prosperity. By cherishing among ourselves the elements and dynamic of a society these predecessors could recognize as rightfully their handiwork we will contribute to our own ever-continuing maturation, and be better armed to assist friendly peoples in preserving a homeland of their own. Then Congress might give up on evasion, farce, and melodrama, eschew posturing and sentimentality, and provide, through laws which we clearly require, for the survival of the Republic (pgs. 120-3). Bradford, M. E. ‘Sentiment or Survival: The Case against Amnesty’. Remembering Who We Are: Observations of a Southern Conservative. Athens, Ga.: U of Georgia Press, 1985, pgs. 110-23. Thus far the enemies of the South have not been able to splinter her into various warring factions, and by so doing further their conquest of her. The South has remained stubbornly united. But as the experiences which welded the Southern people together recede further from our memory (by our own carelessness and by the scheming of our enemies), that threat grows immeasurably as all the disintegrating forces of godless materialism come to bear on us. One thing can keep us united, as it has other countries even during times of the greatest trouble (Serbia under the Turks, Romania under the Communists, etc. ): Christianity. Reverence for the Bible and its life-giving words by Southerners has already done much in this regard. But this is not yet true unity in the Holy Spirit, the fulness of the Faith. As we noted earlier (‘The South and the Scriptures - Part II’), making the Bible the final authority in the Church’s life spreads the plagues of relativism and sectarianism, as each man decides for himself what this or that passage means, and thus what is true doctrine and what is not. In the past there were enough dangers outside and within (war, grinding poverty, etc.) that we turned a blind eye to doctrinal differences (although every step away from the Truth will bring harm to society in the end). However, as we daydream now in the soft comfort provided by the new trinity of Science, Industry, and Technology (Wendell Berry), those forces mentioned above that drive people apart are beginning to act more strongly upon us: Atomistic individualism rears its monstrous head, and it will take more than a watery ecumenism among Baptists, Catholics, Presbyterians, Pentecostals, and so on to overcome it. What the South needs if she is not only to endure as a distinct nation (or confederation of State-nations, to be more accurate) but also to attain the perfection of the gifts, the realization of her unique personality (separately as States and together as a whole cultural region), and the fulfilment of the ministries she has been given to perform in the world by the Lord, as we come to maturity in Him, is a return to the Ancient Faith, the Orthodox Faith, and repentance for the unfortunate deviations from the Truth by the Catholic and Protestant churches. One of my ongoing fascinations is what I have come to refer to in my head as “the Evangelical appropriation of tradition.” Charismatics are celebrating Lent. Baptists are talking about the Eucharist. The inscrutable maybe-universalist and now Oprah-darling Rob Bell is even using the phrase the tradition. Maybe this tradition stuff isn’t so bad. I can branch out a little. I can line up some Athanasius next to my MacArthur, and a volume or two of Gregory of Nyssa next to my Bonhoeffer. Osteen still goes somewhere preferable near the bottom. (Who gave me that book, anyway?) Maybe we’ll put Origen down there with him. Both are questionable, right?. Oh, hey, I’ve heard Ratzinger is kind of interesting. And that “wounded healer” Nouwen guy’s onto something. Has anyone heard of someone named “Schmemann”? At the time of the writing of the Declaration, the meaning of the word happiness was greatly debated. Some restricted its meaning to only the acquisition of material possessions. For others it meant absolute freedom. Others insisted that happiness was attained only through the practice of reason and truth. Today, the meaning of happiness has been reduced to an almost exclusively emotional state. Happiness is predominantly seen as nothing more than a mood. The question, “Am I happy?” can be answered with a quick glance at the emotional thermometer. “No, I’m not happy, but I may be after I get some ice cream.” Today’s dictionaries reflect this reduction: “feeling or showing pleasure” But a closer look reveals that happiness is rooted in contentment and being joyful. In the ancient Christian tradition, which preserves God’s revelation of truth to man, authentic contentment (“a state of peaceful happiness and satisfaction”) is rooted in accepting things as they are rather than longing for change. “He who has no desires,” says St. Dorotheos of Gaza, “has all he desires.” Trusting in God’s providence, and desiring salvation over everything else, the Christian accepts “all that comes to me throughout the day with peace of soul and with firm conviction that Your will governs all.” When we want what we have, we have everything we want. When we desire what comes to us, we are constantly achieving our goal. And as the angst to be a consumer, lusting with envy after everything we are capable of desiring but do not have, begins to die down, we find our minds and hearts freed up to actually be happy and begin working towards God’s goals for us. Wind and water, what is seen, what is not. Stinging all with unseen venom. Texting, surfing, talking - with the soulless. By Our Savior’s hanging upon one of their kind? Burnt in the engines of Progress, never-satisfied.